Article: Where is Thy Sting? 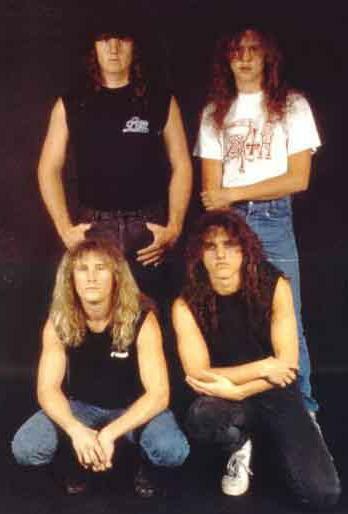 It's the witching hour and I'm snatching information from the very jaws of death, so to speak, in the foreboding shape of Chuck Schuldiner, singer/guitarist and founder member of those Florida Fatalists, Death! Back in 1983 these guys started pounding out a style of metal that was less fashionable or tasteful than a present day South African cricket tour! But there's nowt curiouser than extreme sub-genres, as they say up north, and a few years on the sudden emergence of bands like Obituary, Morbid Angel, Sepultura, Atheist and Pestilence, have all given death a new lease of life - if you see what I mean! Consequently there has never been a more opportune moment for the bona fide originators of the genre to come roaring back with their third, and to my mind best, album to date. With a casualty list of such ditties as 'Defensive Personality', 'Altering The Future', 'Within The Mind' and the title track itself, 'Spiritual Healing', we have a slower, more melodic, and more varied sound to contend with. It's obvious that in 1990 with a sustained European tour on the horizon, we are not talking about sudden Death, or even a violent Death, but a far more marked and lingering expiration! I asked Chuck if the mature sophistication of their third offering is a natural Death? How much of this new direction was encouraged by the second generation of death bands, most of whom are still concentrating on speed and hack and slash subjects? Now Chuck has brought the subject of long standing guitarist Rick Rozz being ousted from the Death ranks (not for the first time) I though he might explain himself further. Scott Burns has given Death their best EVER production and one of the high spots is the work of drummer Bill Andrews, surely one of the most underrated musicians around. Do you think that with various bands getting prominent deals and coverage death metal is now being seen as a musical force in its own right?